Oh, you lucky English ducks. Lots of good music to be heard at Fabric on Saturday, November 22nd, and we’re going to help you experience it for free. Room one offers Pedro (better known as Petre Inspirescu), a live set from Half Hawaii (Sammy Dee and Bruno Pronsato), and a DJ set from Mr. Dee as well. 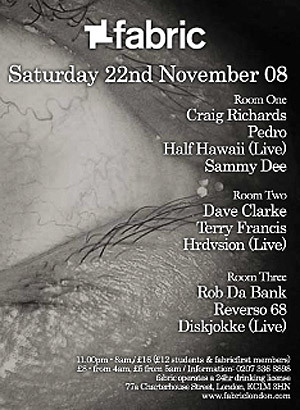 Room two features Dave Clark and a live set from Hrdvision, while room three mixes things up with Rob Da Bank, Reverso 68 and a live set from Diskjokke. Residents Craig Richards and Terry Francis will, of course, be on hand. So if you want to score one of two pairs of tickets, simply answer this trivia question: On what label and with which other artist did Sammy Dee release his first 12″? Send your answers to editor(at)littlewhiteearbuds(dot)com by noon (CST) Thursday. Two correct answers selected at random will win. Good luck! Update: Congratulations to Thomas Barrett and Glen Kristensen on their correct answers (Sammy Dee’s first 12″ was a collaboration with Heiko Laux on Kanzleramt). They’ll be checking out this show with a guest for free. Keep reading for more chances to win tickets to Fabric.